Faro, a restaurant we already knew was one of Bushwick's best, has been awarded a star in the 2017 Michelin dining guide. For those who are not religious followers of the food world: the Michelin guide is compiled by a secret cadre of diners who evaluate restaurants around the world throughout the year. The process is so secret that even top executives within the company do not know who they are. Faro joins NYC stalwarts such as Peter Luger and Minetta Tavern on the list. Elsewhere in this year's edition, Blanca, Roberta's swanky cousin with a prohibitive tasting menu price tag, maintains its two-star rating. Faro received a nod from Michelin last year, too, when it made the Michelin Bib Gourmand Guide, a separate category for restaurants that offer two courses and a glass of wine or dessert for $40 or less before tax and gratuity. "Today, it is my great pleasure to announce that we have earned our first Michelin Star," chef Kevin Adey posted on his social media today. "Our team pushed so hard this year and I couldn't be more proud! For our little neighborhood restaurant to be recognized with the best restaurants in the world is absolutely astonishing." The fresh acclaim might make reservations at Faro more difficult to snag, but the homemade pasta, locally sourced ingredients, and superb whiskey sour make an attempt worth it. The Michelin guide doesn't officially drop until Thursday—h/t to Eater for finding a copy a few days early. Congrats to chef Kevin Adey and crew! 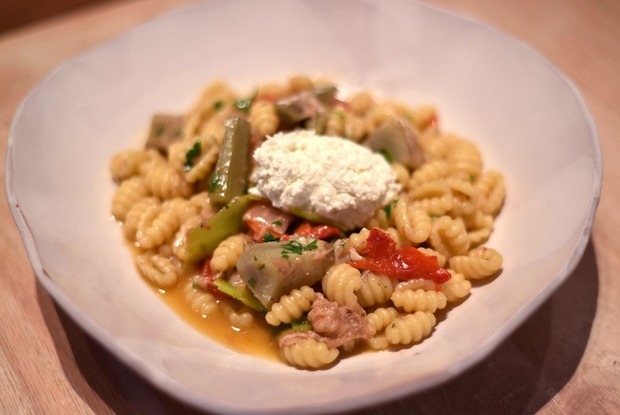 Fresh, local ingredients are highlighted at this Italian eatery. Featured image: Faro Gnocchi Sardi lo. Photo by Michael Tulipan, courtesy of Faro.